Cauliflower is a vegetable in the Brassica oleracea species, which includes cabbage, broccoli and kale. 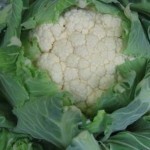 Most of the Cauliflower vegetable is edible, but most people just prefer the head which is formed of flower stalks. The head of a cauliflower is usually white but can also come in purple and green as well. Cauliflower is a very versatile vegetable and can be roasted, mashed, stewed, stir-fried or boiled, used in soups, or gratins or eaten raw. Follow a recipe; follow food safety & hygiene rules; tidy away; use measuring spoons and cups; chop using bridge/claw technique; snip herbs with scissors; crush garlic; use the hob (with adult supervision). Knife, chopping board, large saucepan, wooden spoon, measuring spoons, jug, whisk, bowl. Heat the oil in a large saucepan over a medium heat and fry the onion until just golden. While the onion is cooking pound the garlic, chilli and ginger with a pinch of salt until they form a paste. Tip in the rest of the spices and stir until the mustard seeds start to pop. Add the potatoes and cauliflower, and fry, stirring frequently, for five minutes, so that the vegetables are well coated with the spice mixture. Pour in 400ml of water, bring to a simmer, cover and cook for 10-12 minutes, until the vegetables are tender. In a bowl whisk together the yogurt, tomato puree and some of the hot cooking liquid. Remove the curry from the heat, stir in the yogurt mixture, return the pan to the heat and warm through gently. Stir in most of the coriander, add pepper to taste, and serve scattered with the remaining coriander. 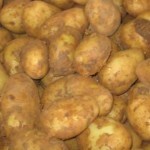 Potatoes are a nutritious and filling starchy food; low in fat and a source of vitamin C and fibre.